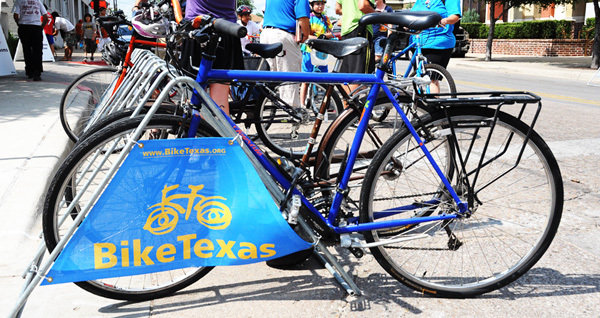 Since 1991 BikeTexas has served to advance bicycle access, safety, and education. The launch in 2015 of our Bicycle Valet program continues to move this mission forward. We can provide many levels of service staffed valet to provision and placement of temporary self-parking racks. Our rates vary according to size and length of events. Email us to request a quote or call 512-476-7433. Our friendly and professional staff ensure that bicycles and their accessories will not be stolen, and we help keep your event tidy. When you offer bike valet, you help attract more people to your event by giving them a secure place to park their bike. We’ll also promote your event through our website, Facebook, Twitter and emails. 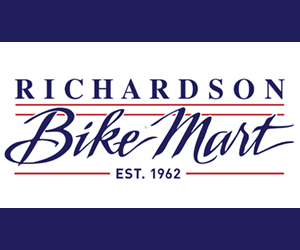 We’re excited to promote events that value helping people use bicycling for transportation. Bike valet services make it easier and faster for people to use a bike to get to where they need to go. It takes the worry and hassle out of finding a place to lock up, and helps attendees relax and enjoy the event knowing their bike will be there when they get out. Giving those who ride a VIP treatment helps encourage others to try riding a bike to your next event and save the cost and headache of finding parking. What size of events benefit from bike parking? We can cater solutions to an event of any size, from a field of hundreds of bicycles at your major music festival, to a tidy row of a dozen bikes parked by an authentic British butler* outside your private party. All your guests will be impressed with your support of bicycling when you use bike valet. With gusto. Valet Bike Parking encourages more people to get to your event by bike, and we advertise all our valet events on our website, social media, and emails. When you offer bike valet you help attract more people to your event by giving them a secure place to park their bike. How does bike valet help keep my event tidy? Instead of haranguing attendees about not locking up to your barricades, you can add secure parking allow your event staff to be positive and friendly when directing cyclists to the parking corral. As a bonus, most people who would have locked to poles and fences will seek out our valet stand instead. I don’t need valet service, just extra bike parking. Can you help? YES! We also rent high-quality, self-parking racks from Dero that park up to 14 bikes each. Email us for more info or call 512-476-7433. *Availability of British butler bicycle attendant may vary or be non-existent. But we are happy to arrange the attire of our professional staff to suit your custom needs. Just like a car valet or a coat check, you sign a claim ticket and give us your bike. We park it in our secure corral under the watchful eyes of our staff. After the event you come back with your ticket stub and we give your bike back. How much does it cost to park my bike with your valet service? It’s free! We are hired by the event organizers to provide this as a service. Technically no, but we highly recommend it. It’s possible our bike corral will reach capacity, or you may want to stop somewhere on your way home from the event. Can I leave stuff with my bike? Yes, but we ask that you limit it to helmets, locks, lights, and closed panniers/saddlebags. We don’t inventory your accessories and can’t be responsible for them, but anything securely attached to your bike will be safe. What if I can’t get back in time to get my bike? Will you keep my bike for the after after party? You must retrieve your bike by closing time, which is typically 30 minutes after the end of an event. After that time, valet will close. If you are unable to pick up your bike after an event, you must contact after-hours bike valet support staff at 512-476-7433. If I’m running late, can I just leave my bike and run off? Will there be a line? There can be a rush at the beginning or end of an event. We work quickly and keep the line as short as possible. Everyone must check in and get a ticket to leave their bike, and must present their ticket stub at the end to retrieve their bike. Can I park my unicycle, skateboard, baby stroller, scooter, etc? Sure thing. We will park all non-motorized people movers (plus e-bikes) for which we have capacity. * Just kidding! Even you, John Nash, will need your ticket stub. Yes, we have that too! BikeTexas offers self-locking racks for rent as well. For the self-suficient, these racks can be placed outside your event for people to lock their bikes up themselves. Our sturdy Dero racks make bike parking very user friendly and keep bikes organized. Each rack holds 14 bikes. We rent our racks for $30/day per rack. Delivery is an option with rental of 10 or more racks. Bulk rates and discounts for non-profits available upon request. Questions? 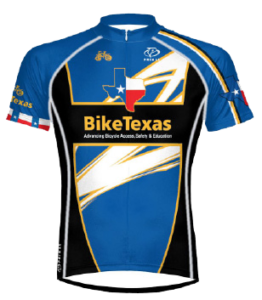 Email us for more information at rentals@biketexas.org.